I’ve been waiting to post these projects up, basically because most of them have been made as presents for friends or family…and I’m only just starting to deliver them! So hoping I don’t spoil a wee surprise, here are the (bare) details. 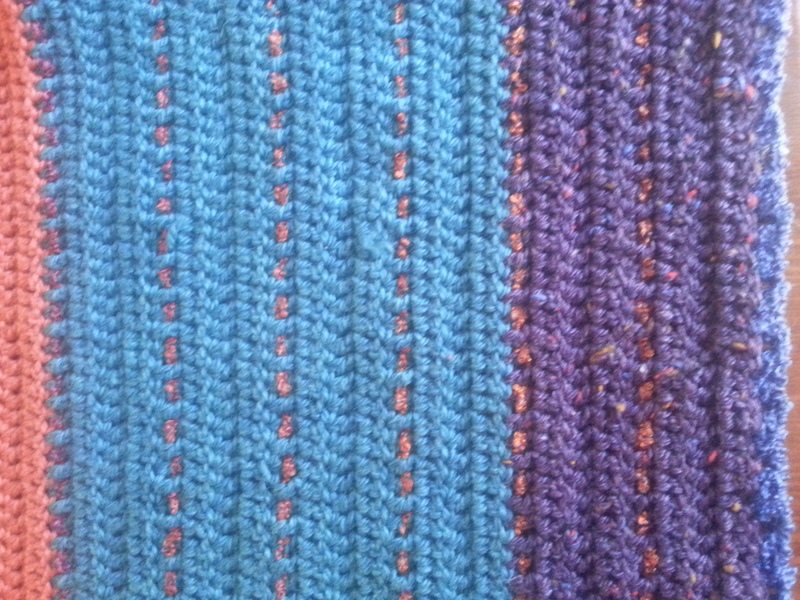 Yarn: 8Ply 100% wool (mostly) with acrylic for the detail. Both from Spotlight. Pattern: there isn’t one. 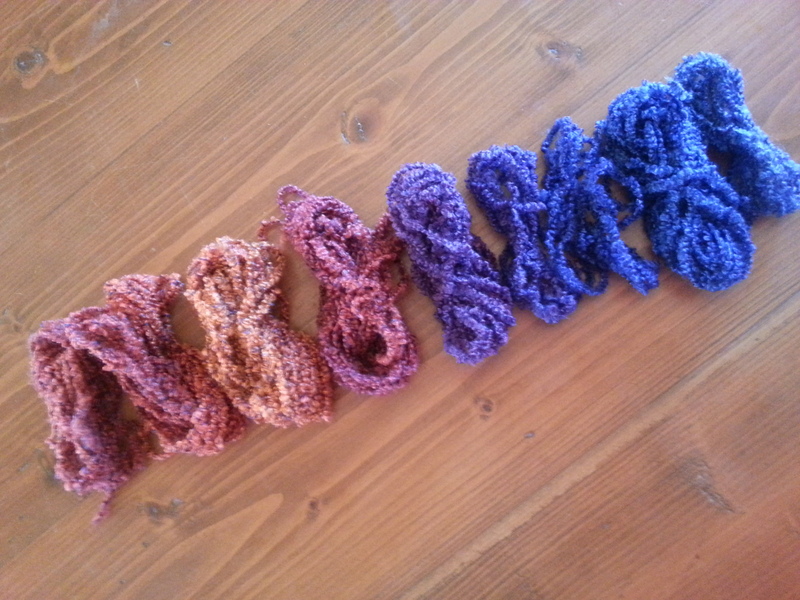 I just started with a long chain and keep double crocheting (DC) until I got to the desired size. Then I ran out of wool. The I changed colours along the way, so I undid a little of what I had done…and a dear friend and colleague came to the rescue, suggesting the purple and extra detail. 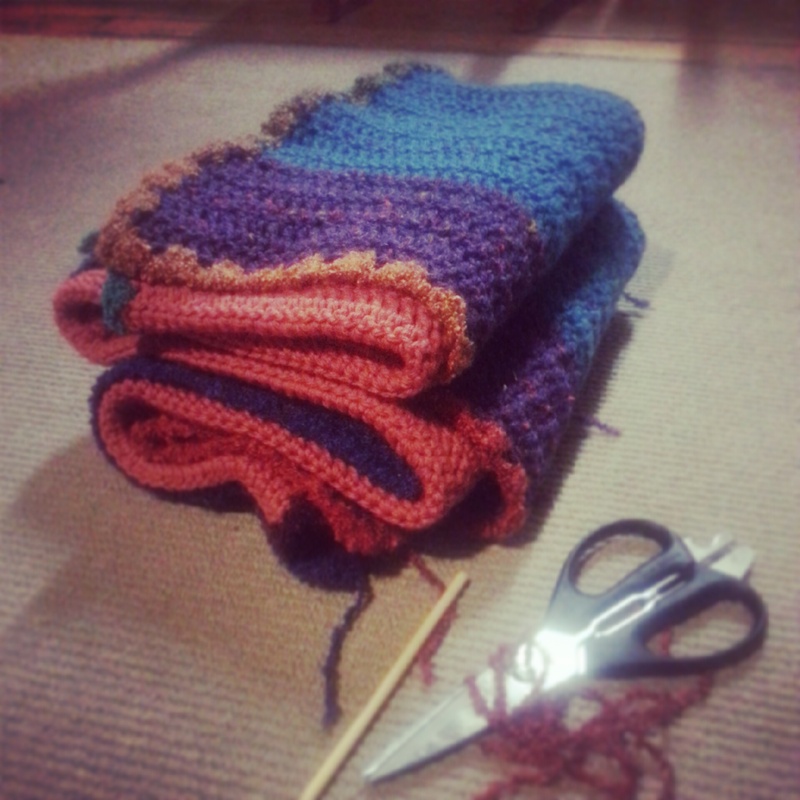 At first I loved it – the weight of a large blanket growing on my knees certainly helped to motivate me each night and keep going with the l-o-n-g rows…then I grew tired of it. 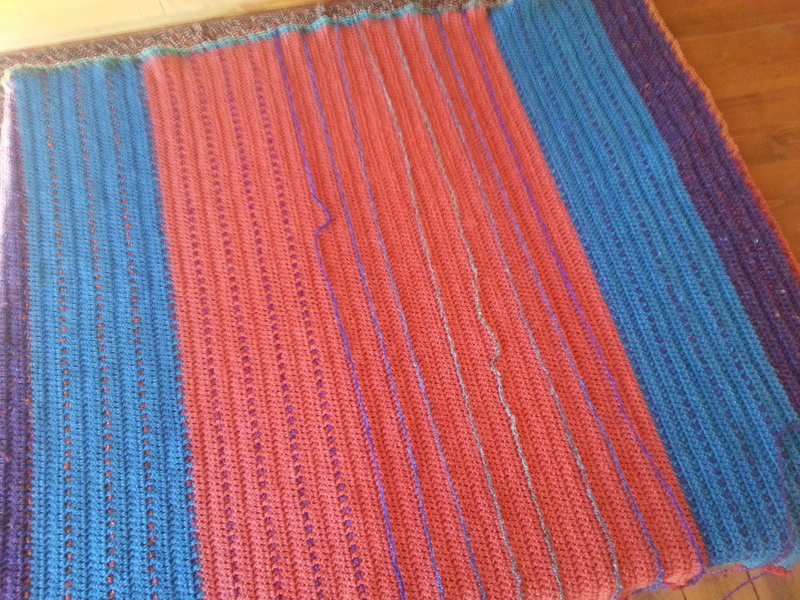 I put this blanket aside, I rethought my ideas (a stripey blanket big enough for a double bed) and even almost unpicked the whole thing. 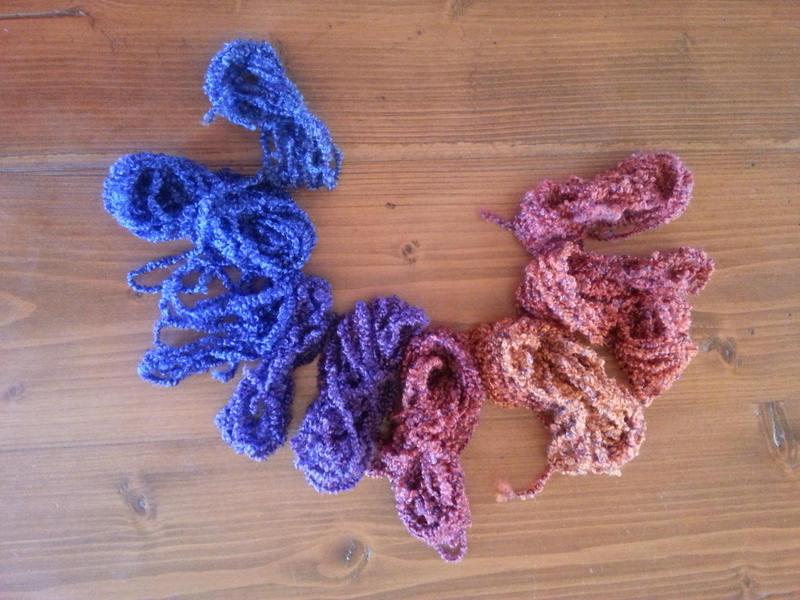 Then I discovered this self changing acrylic ball of wool in my favourite sunburnt-country-summer-beach colours…. In the end the size in a generous couch throw – perfect for a spot of cold night TV viewing or book devouring. It was only in the final steps on finishing the border that I knew I needed to add in the “stitching” to really capture the feeling I wanted (“roads travelled, milked covered”). 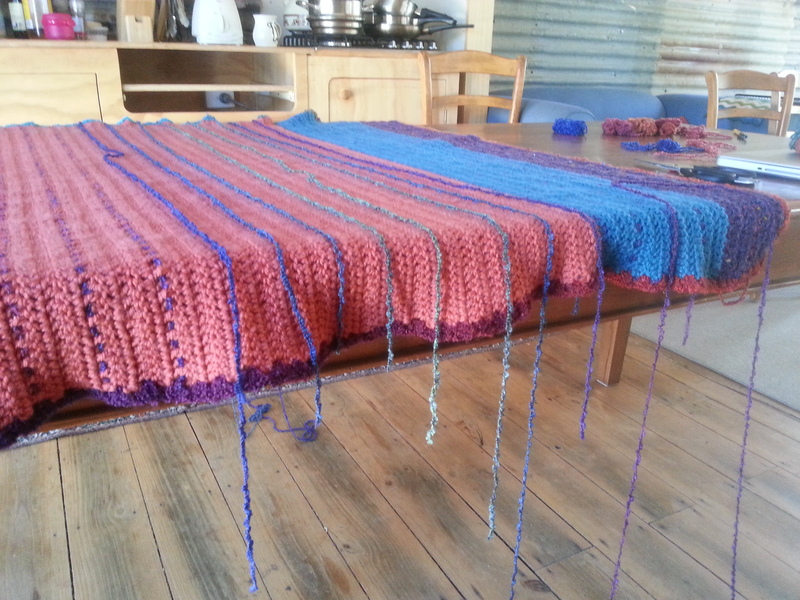 The name of this blanket is in part due to the process I undertook to get from start to finish – organic in nature, this project has come with me through several moves across two states. Through a huge transition year. And it has evolved from a single ball of wool to what it is today. The finished result is something I fell in love with all over again…the colours all come together so well – if I do say so myself!! 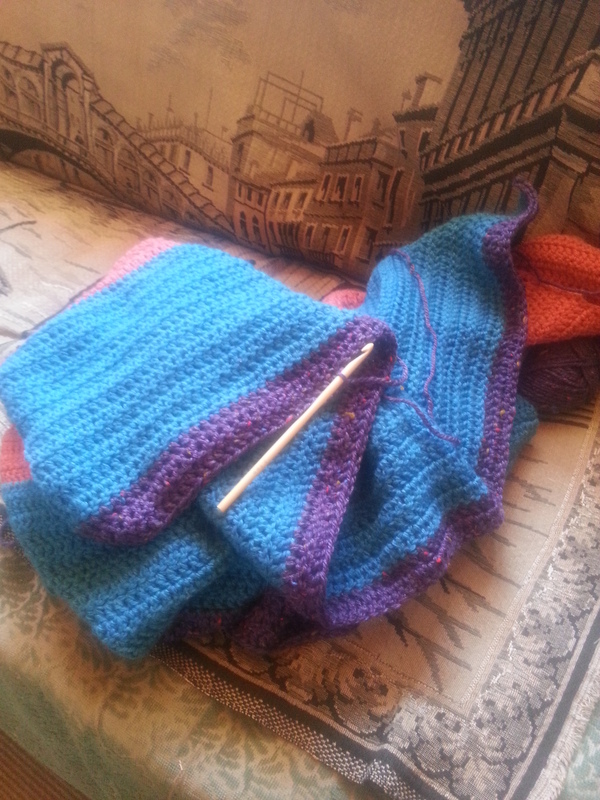 Also, the friend who will receive and (hopefully) get good use from the blanket is undertaking a big journey of her own – all the way around Australia. I hope it reminds her of me, of the land we live in and the importance of the ups and downs of life’s journeys…. « The hard lessons [to be] learned.